Just like the first two pipes, Curvy 03 has finally arrived with affection and simplicity exactly two years on. Despite being a challenge, we still really believed in our curious, chubby Curvy when we took it to InterTabac in Dortmund, September 2015. Compact, yet high-performing, it revolutionised classic pipe standards – how would smokers and the press react to it? The reception was so immediate and positive that we were amazed. Perhaps pipe connoisseurs and in general those who love beautiful things were looking precisely for something that would astonish them. Initially, two models were designed in four different colours, but recently Curvy has extended its range of colours up to seventeen. 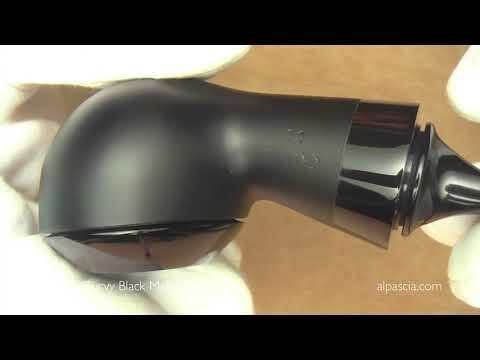 Never have so many colours been seen on a high quality pipe, whether bright, glossy or matte. 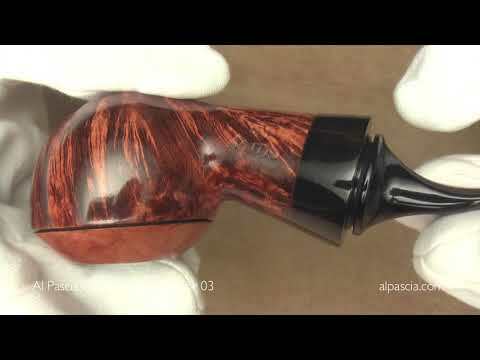 This new challenge also seems to have met with approval judging by the response from Al Pascia’s clients, who seem to have established a special relationship, almost as if the pipe were a friend or partner. Indeed, a friend who never ceases to amaze us with its cheeky aspect, at the same time keeping its promise as a smoking device to produce smooth, intense sensations that only the friends of Curvy are familiar with. This is also because beneath the most intense colour beats the noble heart of briar. Now that 03 is ready we can set aside the various trials, alterations, second thoughts and all the time that it took to achieve the final result in our hands and yours. Speaking of standard models, this time we were initially inspired by the Rhodesian, namely by its squashed shape, sharp corners and thin groove cut into the bowl that separates the upper part and lower parts. 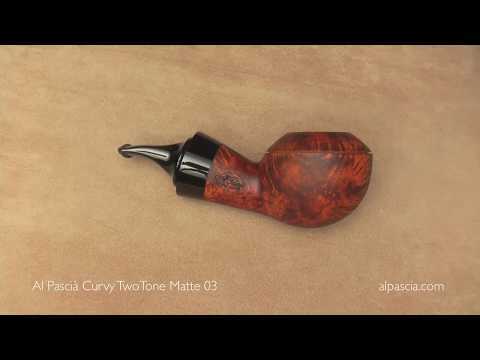 But Al Pascia’s Curvy is only Curvy: what is left of the initial inspiration is a memory of its shape, proportions and single groove cut into the briar. 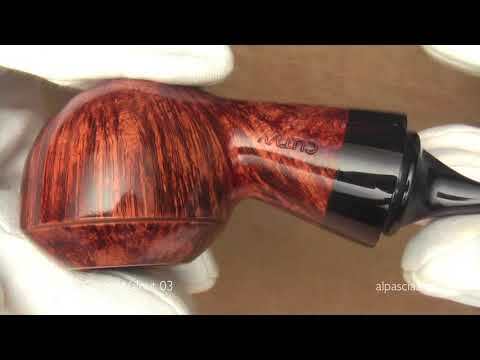 Opting in favour of a half-bent stem came naturally while crafting the pipe, without thinking beforehand that the Curvy range did in fact lack a half-bent model. 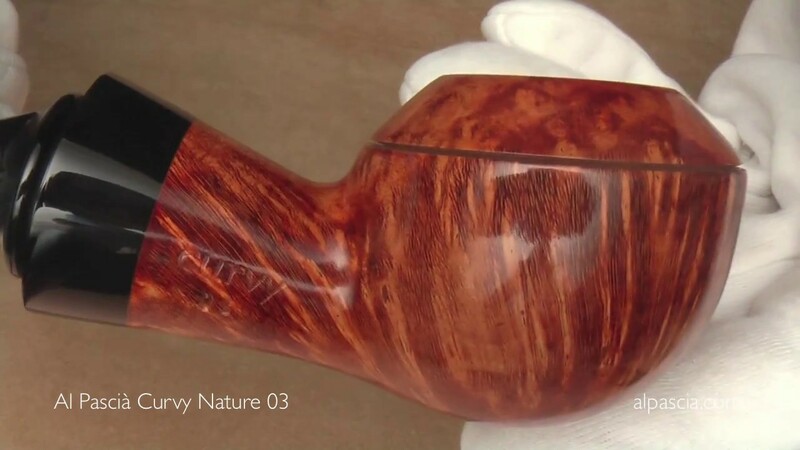 Curvy 03 has kept all the features typical of 01 (full bent) and 02 (straight), starting with its unique squat shape and the fact that it looks like a pocket size Calabash crafted from high quality briar, not gourd. The introduction of the groove in the bowl allows the upper and lower parts to have two different colours: the incorrigible Curvy never ceases to astonish us! We have presented Al Pascià Curvy 03 at InterTabac 2017 (Messe Westfalenhallen Dortmund) Hall 4, Stand 4A08.